COLUMBUS, Ind. 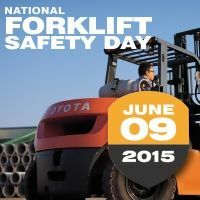 (June 5, 2015) – In an ongoing effort to increase the awareness of forklift safety, Toyota Industrial Equipment is proud to support the second annual National Forklift Safety Day (NFSD). Forklift manufacturers from across the U.S. will gather in Washington D.C. on June 9, 2015, to educate customers, policymakers and the Administration on the safe use of forklifts and the importance of operator training. The timing coincides with National Safety Month.